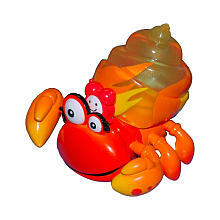 Meet Xia Xia Trinidad the orange funny crab to collect. Trinidad has orange body and comes with orange shell and orange kooky friend alarm clock. If you like him vote for him on th official website. The best friend of Trinidad is of course Tobago the blue Xia Xia crab with strong personality and good sense of humor. Sha Sha crabs love to chill out, dance and play, you also can join the Xia Xia Party it's gonna be lots of fun. These cute electronic toys are great find for all the moms who have little kids. Young boys and girls will love to play with Sha Sha toys, because they are funny, colorful, collectible and so cute. It's also very easy to control your crab pet and it's not gonna be broken easily. I definitely recommend this toys for boys and girls ages 3 and up. Xia Xia Crab Toys are so much fun!